You might be familiar with the 2004 movie Closer. But did you know it was a play before it was a film? Today we’re joined by co-producers of a new production of Closer that brings together actors from England with tech students from Baltimore School for the Arts, as part of a long-standing collaboration between the school and Showdown Theatre Arts UK. We’re joined by Shana Amall and Carli Jones, Co-Directors, Co-Producers, and Actors in Closer, and Ann Mladinov, Coordinator of International Exchange at Baltimore School for the Arts. 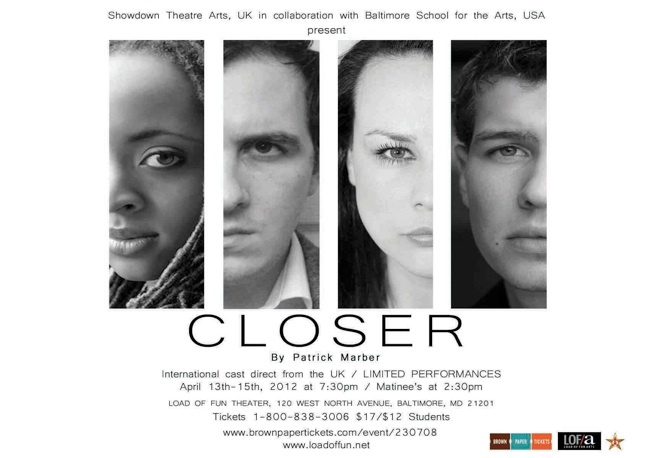 Don’t miss Closer this Friday, April 13th – Sunday, April 15th at the Load of Fun Theatre, 120 W North Avenue. 7:30 pm Friday – Sunday and 2:30 matinee Saturday and Sunday. For more information, click here.